"Imagine trying to survive everyday life but everywhere you turn your behavior turns into a crime," says David Cardoza, MSW, from the House of Hope Community Development Corporation in Rhode Island, an agency that works with people who have experienced homelessness. Recent news reports show a significant uptick in citywide bans of human activities that people who have no home, and no way to get a place to live, must engage in to survive. These activities include sitting, standing, lying down, sleeping, eating, sharing food, drinking, urinating, and defecating. The National Law Center on Homelessness & Poverty (2016) found in a survey of 187 cities that since 2011 there has been an increase in laws criminalizing homelessness. Citywide bans on camping in public have grown by 60%, bans on begging in public have grown by 25%, bans on loitering have increased by 35%, bans on sitting or lying down in particular public places have increased by 43%, and bans on sleeping in vehicles have increased by 119%. In major cities across the United States there are fewer shelter beds than needed, leaving thousands of people each night with no option but to live and sleep on the street. Many believe that homelessness is caused by mental illness, addiction, and/or poor decisions and that most people who live on the street do so by choice. The causes and consequences of having no safe, affordable, secure place to live are much more complex. Social workers are in a unique position to understand the powerful systems issues that cause homelessness, educate others about them, engage in legislative advocacy, organize communities to respond in truly meaningful ways to homelessness, and provide direct services, including case advocacy and case management. Consider Heather, age 58. Having worked all of her life, one day she is injured and unable to crawl out of bed because of the pain. After two weeks she runs out of sick leave, loses her job, thus loses her income, apartment, and health insurance. She couch-surfs for two years, exhausting friends' generosity, finds no room in any public or private shelter, and ends up sleeping on the streets, where several times she is mugged and raped. Traumatized, now struggling with anxiety and depression as a result of what has happened to her, alone with no money, social support, or options, Heather stands on a corner holding a sign that says, "I'm homeless. Please help," and is then arrested for loitering and violating the city's antipanhandling law. Having nowhere to bathe, she becomes filthy and malodorous. Needing to urinate, she tries to enter restrooms at fast food restaurants, office buildings, and schools to use the facilities. She is shooed away at each place, as the sight and smell of her are seen as bad for business and a threat to others' feelings of safety. Desperate, Heather hides behind a dumpster in an alley to relieve herself, where someone sees her and calls the police, who arrest her for indecent exposure. With no money for bus fare, she must walk everywhere, including to soup kitchens, government offices to apply for SNAP and SSDI, and to get the IDs and other forms of documentation needed to complete the SNAP and SSDI applications; the public library to use the computer to look for employment (although with no cellphone and no address, there is no way prospective employers can reach her to follow up on her online applications); hospital emergency department; and mental health center to seek treatment for her PTSD. When her socks disintegrate from the relentless walking, leaving her feet blistered and bloody, Heather sits on a bench or curb, with nowhere else to rest, and is arrested again for loitering. At night, unable to walk another step to get to a shelter, she lies down on a patch of grass to sleep and is arrested for breaking the town's law forbidding sleeping outdoors. Camping in a tent without a permit is also forbidden, and she has no money or transportation to obtain a permit, even if she could find a tent. The city also has a law forbidding storing personal items outdoors, so she has to lug any possessions with her wherever she goes. One time, Heather's back and arms aching from ceaselessly carrying her heavy bundle, she rests it on the ground, someone snatches it, and she thus loses the ID and documentation she spent months laboriously collecting so she could apply for aid. Another time, when she lowers her backpack to the ground in order to rest, police confiscate it and destroy its contents, including her medications, thus deepening her health and mental health misery. While Heather's story may seem extreme, it is actually woefully typical. Even though the U.S. Supreme Court has ruled that antipanhandling laws violate the First Amendment, which protects free speech, some city councils are rewriting their antipanhandling laws in order to get around the Supreme Court's objections. Thus, for example, the city of Cranston, RI, recently passed a law forbidding passing money or literature through a car window to a person on the road or median. Other laws that criminalize activities that people who have no home must engage in have been deemed to violate the Eighth Amendment (freedom from cruel and unusual punishment) and Fourteenth Amendment (right to due process of law). Nonetheless, laws criminalizing homelessness persist because the people hurt by them are too consumed with the struggle to survive, and too poor to challenge the laws in court. As a result, localities sometimes rewrite their laws to circumvent the constitutional objections, leaving the laws' intents intact, to make people experiencing homelessness go somewhere else—out of sight and out of mind. Heather's situation is only a partial illustration of how activities necessary for survival become crimes when a person has no place to live. Fines levied for eating, drinking, sitting, standing sleeping, and urinating not only put a person in legal jeopardy; fines often accumulate and, when unpaid, exacerbate legal entanglement, trapping the person in a circular quagmire of poverty and incarceration. For instance, many locales have "three strike laws"; once a person has been convicted of three misdemeanors, the third kicks the crime automatically up to a felony; the person is then incarcerated and labeled an "ex-offender" or "felon," making it more difficult, or impossible, to get employment, be accepted as a tenant, or even be eligible for certain public benefits that they would otherwise be able to receive. Thus, homelessness, poverty, and incarceration exacerbate each other. Aykanian and Lee (2016) have found that "a recent episode of homelessness is associated with incarceration." In addition, laws forbidding some activities, such as consuming alcohol, are often selectively enforced. For example, a person who "looks homeless" and is drinking alone from an open container, because there is no indoor place where she can drink, may be arrested, while law enforcement personnel do not intervene with someone else who is drinking the same beverage from an open container while tailgating with friends before a sporting event. Contrary to what many people believe, the root causes of homelessness are not located in the personal characteristics of the people who are experiencing homelessness. The root causes lie in social policies that have created a lack of affordable housing and wages insufficient to cover the average cost of rent. Since the 1970s the federal government has steadily reduced its role in funding subsidized housing. In the wake of the mortgage foreclosure crisis that began in 2008, more people are competing for fewer affordable units. Monetary and fiscal policies have created extreme income inequality. People who work full time at minimum wage do not earn enough money to rent even a substandard apartment in many cities. The average SSI check does not cover the cost of rent, much less utilities, food, transportation, and other necessities. A rule of thumb is that a person should spend no more than 30% of his or her income on housing, but many people have no choice but to spend almost all of their income on rent, leaving them just one crisis (such as a car repair or an illness) away from falling behind on the rent and becoming homeless. Destitute, the person is unable to get legal representation in court to challenge eviction. Once evicted, without a home, a person loses all of his or her possessions, is in a state of chronic crisis, and is less able than before to sustain employment. Poverty begets poverty because of such systems issues. According to the National Law Center on Homelessness & Poverty, "for every 100 extremely poor households … only 31 will find affordable and available rental units." Locales that pass ordinances criminalizing homelessness perpetuate the myth that homelessness is a choice, and that pushing people away is a cost-effective strategy to end homelessness. Criminalizing homelessness seeks to move people out of sight in order to enhance the city's attractiveness for business and the overall quality of life for its housed residents. Clearly, the criminalizing further victimizes the most vulnerable. Such policies enable lawmakers to avoid addressing the economic, structural, and social issues that create and maintain homelessness. Driving people with no home away from populated areas only exacerbates their predicament, because social and human services are often located in the population areas from which people experiencing homelessness are expelled. Expelling people is at best a temporary solution, as people return. The criminalization policies are costly in other ways as well; they require substantial public money for policing, court processing, and incarceration. These funds could be devoted to creating safe, stable, affordable housing to end homelessness and programs to care for people who are struggling with the consequences of homelessness (e.g., physical and mental illnesses including substance use disorders). Numerous studies show that reducing homelessness reduces the costs of jailing and hospital emergency department use. The NASW Code of Ethics clearly states that the profession's mission is to pursue social justice and alleviate oppression, focusing on the most vulnerable among us. Yet, according to Aykanian and Lee (2016), professions such as sociology, law, and urban planning have paid more attention to homelessness than has social work. Challenging laws that criminalize activities necessary to sustain life when a person faces homelessness is an important social work advocacy task. Social workers in Rhode Island have, for example, joined forces with the American Civil Liberties Union to challenge the city ordinance outlawing passing money or literature through a car window to someone on the street or median. Working in concert with people experiencing homelessness, social workers, purposefully and in full view of police, handed motorists informational leaflets about the problem, were fined, and are working their way through the courts to challenge the law. Social workers are also trained to pursue policy changes through engaging in electoral politics, legislative lobbying, and influencing policy makers in private and governmental agencies. For example, social workers can advocate for federal funding to construct safe, stable, affordable rental units, provide rent subsidies, outlaw landlords advertising "No section 8 vouchers accepted" when advertising for renters, advocate for zoning laws that require new housing construction projects to include making a percentage of the units affordable, and pass inclusionary laws that overcome NIMBY ("not in my back yard") obstacles to creating affordable housing that offers noncoercive supportive health, mental health, substance use, case management, and other supportive services. In addition, social workers can build relationships and collaborative alliances with city officials, law enforcement officers, and downtown merchants, educating them about how biases regarding people experiencing homelessness result in differentially enforcing laws that end up criminalizing homelessness. The aim is to raise awareness and recruit others as allies in efforts to respond effectively and compassionately to behaviors that are currently criminalized. For instance, when police and merchants understand that shooing away people with no home victimizes people who have no viable options, they may become more willing to work together to create safe, warm, appealing places where people who have no home can spend the day, store their possessions, meet their hygiene needs, and engage in activities such as case management. The fragmented patchwork of inadequate services to help people experiencing homelessness leaves huge gaps in care and creates sometimes insurmountable obstacles to applying for benefits. Advocates report that too often providers behave toward people experiencing homelessness in ways that come across as judgmental, coercive, paternalistic, controlling, degrading, blaming, demeaning, dehumanizing, and vilifying. As a result, prospective clients, feeling scorned and mistreated, protect themselves from such abuse by shrinking away from services. The phrase "Let me help you" can cause a trauma response. Hence, there is evidence that providing trauma-informed services in the prospective client's life space, right on the street rather than in professionals' offices, can be an effective engagement strategy. A slow, gentle, relationship-oriented approach that allows the prospective client time to begin to trust the worker has been shown to be useful. Homelessness itself is traumatic, as are the circumstances leading to homelessness. Trauma after trauma occurs, leading people who must live on the street to feel wary, hypervigilant, anxious, fearful, mistrustful, and guarded. These feelings and behaviors are adaptive, necessary for survival, and wisely self-protective; they should be viewed as strengths, not as lack of motivation, oppositionality, resistance, manipulativeness, or a preference for homelessness over safe, stable, affordable housing. When a person who is experiencing homelessness has an angry outburst, comes across as hostile, or shies away, that is best understood through a trauma-sensitive perspective, and a compassionate response is most likely to be effective. When providers instead use punitive consequences and countercontrol measures, they aggravate the trauma. A more helpful stance is, "What happened?" rather than "What's wrong with you?" Instead of assuming what the person needs, it's more useful to offer what the person says is needed. So, for instance, if a person in dire need of cancer treatment wants instead to focus first on getting a cellphone, that is where the worker should start. Social workers' roles can include community organizing to bring together human service workers, including physicians, lawyers, public health nurses, substance use counselors, outreach workers, and mental health providers, forming street outreach teams that include as equal team members the people experiencing homelessness whom they hope to engage in services. In addition, specialty courts and diversion programs can help people avoid criminal justice involvement. 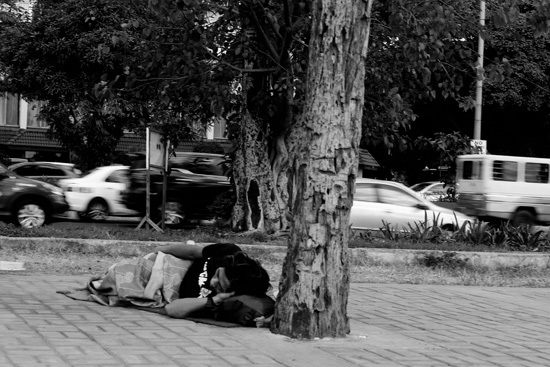 Loitering, sleeping on the street, relieving oneself outdoors, and other criminalized behaviors will not be necessary when people with no home have ready access to safe day centers where they can shower, wash clothes, eat nutritious hot meals, receive health and mental health care, get case management and social support, and engage in other meaningful activities. Public libraries, too, may be useful places where outreach workers can engage prospective clients. In short, social work's unique simultaneous dual focus on both the individual and the environment as targets for change, on the interface between private troubles and public issues, and on comprehensive biopsychosocial spiritual approaches puts the profession in a unique position to address homelessness effectively. Public advocacy to decriminalize homelessness is an important part of a multipronged social work approach. Aykanian, A., & Lee, W. (2016). Social work's role in ending the criminalization of homelessness: Opportunities for action. Social Work, 61(2), 183-185. National Law Center on Homelessness & Poverty. (2016). No Safe Place: The Criminalization of Homelessness in U.S. Cities. Retrieved April 18, 2018, from https://www.nlchp.org/documents/No_Safe_Place.